According to MailOnline, It’s been described as a ‘suicidal mission’ that is doomed to fail. Despite this, 100 people including five Britons have been shortlisted for the Mars One mission, which aims to send people to live on the red planet. The five British candidates are all under the age of 35 and hope to be chosen to be among the final crew of four who are set to begin their new lives in just 10 years time – and ultimately die on Mars. The team is scheduled to arrive in 2025 following a grueling seven-month journey from Earth. ‘The large cut in candidates [from 200,000 to 100] is an important step towards finding out who has the right stuff to go to Mars,’ said Bas Lansdorp, co-founder of the Dutch Mars One mission. These aspiring Martians provide the world with a glimpse into who the modern day explorers will be.’ The Mars 100 Round Three candidates were selected from a pool of 660 candidates after participating in personal online interviews. They include 50 men and 50 women who successfully passed the second round. Claire Weedon (above) is a potential martian and the only Briton who doesn’t work in science and is a self-confessed adrenaline junkie. Dr Alison Rigby, a 35-year-old laboratory technician from Kent (above) is also through to the next round of selection. Hannah Earnshaw (above) a PhD student in astronomy at Durham University, is one five Britons who have been shortlisted for the one-way trip to Mars in 2025. Maggie Lieu (pictured above), 24, an astrophysics PhD student at the University of Birmingham was also chosen. She said: ‘Space travel has been a dream of mine for a very long time, and now I have the opportunity for something even bigger’ and even hopes to become the first mother on Mars. The majority of the 100 applicants come from the US, 31 come from Europe, 16 from Asia, seven from Africa and seven from Australia. The full list can be viewed here. The British hopefuls comprise three science students, a laboratory technician and a self-confessed adrenaline junkie. Hannah Earnshaw, 23, a PhD student in astronomy at Durham University, is among the British hopefuls. Her interests include rock climbing, hiking and astronomy. She said: ‘Human space exploration has always interested me so the opportunity to be one of the people involved was really appealing. The future of humanity is in space. WHAT AWAITS THE ADVENTUROUS COLONISTS? Plans about how the four finalists will arrive on the red planet are vague. Mars One simply says that the crew will arrive on Mars in 2025, after a seven month journey from Earth. A landing module attached to a rocket would drop the humans off, before they were met by a rover and taken to the Mars One Colony. There is a possibility that the colonists could hibernate on the long journey. A proposal by Nasa on an unrelated mission suggests a crew could be put in a deep sleep for 180 days, allowing them to make the journey of 350 million miles (560 million km) with a reduced need for food and water. The crew would be kept alive through intravenous feeding, before being woken at their destination by inhalation of a coolant gas. Nasa Administrator Charles Bolden believes that colonising Mars is essential to ensure the survival of our species. ‘It’s important for the preservation of the species, and I want to make sure that my grand-daughters, and great-great-grandaughters, have the opportunity to go there,’ he said. What about when they arrive? After landing on the red planet, the colonists would move into small ‘pods’ – their homes. 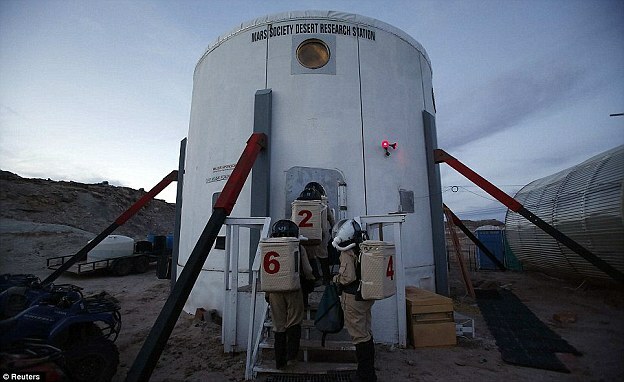 An experiment is under way in the Utah desert to recreate the psychological effects of life on Mars, with four ‘astronauts’ living in isolation for two weeks at a time. Like the researchers from the Mars Society, colonists might expect to survive on food rations, conduct experiments and shower every few days. 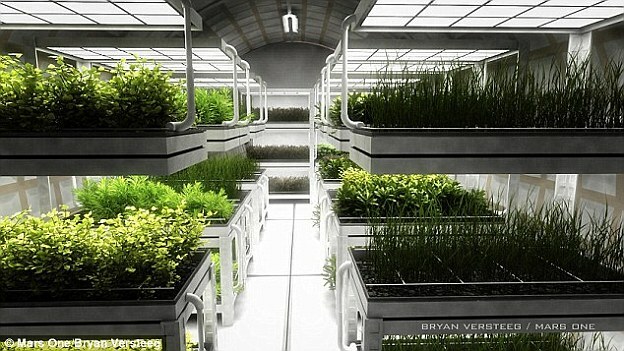 Nasa is also planning a manned trip to Mars and has designed a house with solar panels. In its Hi-Seas experiment in Hawaii, crews of six are living in a small dome with a ‘sense of airiness’ and are only allowed to venture outside wearing space suits, perhaps indicating what may lie ahead for the colonists. The colonists may breathe through a device called Helena, which will could use electrolysis to produce oxygen from water extracted from Martian soil. Designed by the University of Western Australia and a Mars One astronaut candidate, the device could be flown on Mars One’s first unmanned lander mission and arrive on the planet in 2018. What will daily life be like? While living on Mars may seem exciting, it will probably be monotonous spending time in cramped quarters with only three other people for company on the entire planet. Daily tasks might include cultivating food and maintenance of essential equipment. Scientists could fill their hours conducting experiments or perhaps using 3D printing to create objects they need to survive. In November, astronauts aboard the ISS made the first 3D printed object in space – a nameplate to commemorate the achievement. Nasa is studying objects to see how zero gravity conditions affect the printing process, but if they are sound, colonists could use additive manufacturing to produce spare parts and even perhaps games to keep them occupied. WOW! With all of these said, if you were nominated to go to MARS, will you? And why? State your answer in reasons in the comments section below.